Alex Ovechkin ends a four-game scoring drought as Washington shuts down Carolina, 4-1. Ovechkin snapped a shot past Petr Mrazek for the go-ahead goal 4:31 into the third period for his third goal in 10 games. 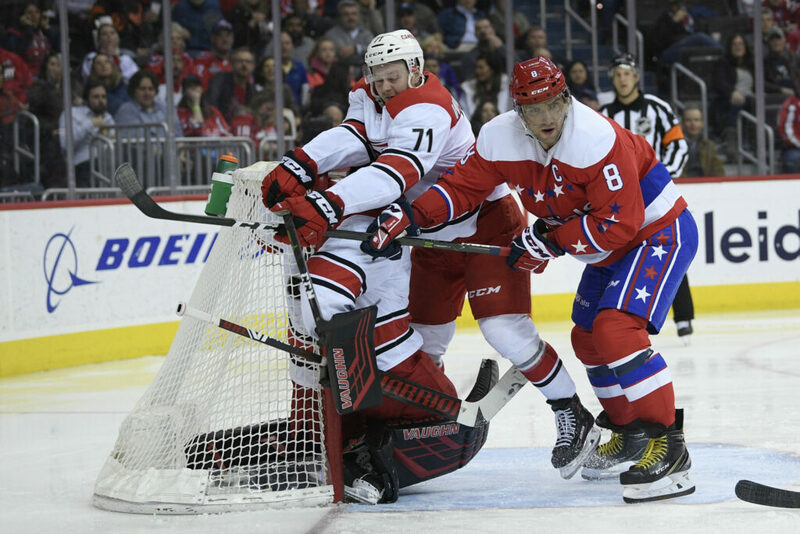 Fans chanted, “We want 50!” after Ovechkin’s goal was announced, but they’ll have to wait at least a couple of days for Washington’s captain to become the third player in league history with 50 in eight seasons. Mrazek, who once made 15 saves on Ovechkin in a single game, stopped him several times before Ovechkin scored through a screen set by Evgeny Kuznetsov. With his 656th career goal, Ovechkin tied Brendan Shanahan for 13th on the all-time list. BLUE JACKETS 4, ISLANDERS 0: Sergei Bobrovsky recorded his second consecutive shutout and host Columbus stayed in the playoff hunt by beating New York. SENATORS 4, SABRES 0: Craig Anderson stopped 35 shots for his second shutout of the season and Ottawa beat visiting Buffalo. Coming off a disappointing 3-1 loss to New Jersey on Monday, the Sabres completed their three-game trip 0-3-0. Buffalo is 1-10-1 in its last 12 and 0-11-2 in its last 13 road games. CANADIENS 6, PANTHERS 1: Tomas Tatar had two goals and an assist, and Carey Price made 33 saves as Montreal won at home. The Panthers, who were eliminated from playoff contention when the Blue Jackets defeated the Islanders, have lost 4 of 5 and been outscored 20-9 during a three-game losing streak. SABRES: The Buffalo Sabres signed Casey Fitzgerald to a two-year $1.85 million entry-level contract after the defenseman completed his senior season at Boston College. Fitzgerald will initially sign an amateur tryout contract and report to Buffalo’s American Hockey League affiliate in Rochester, New York. LIGHTNING: The NHL-leading Tampa Bay Lightning signed Coach Jon Cooper to a multiyear contract extension.